Meanwhile, the Peshawar local council also passed a resolution to ban celebrations of what it called a "useless" day. Kohat district administrator Maulana Niaz Muhammad told the BBC Urdu: "Valentine's Day has no legal grounds, and secondly it is against our religion, therefore it was banned." However, officials in both places later said the bans had been discarded or ignored for being unpopular. 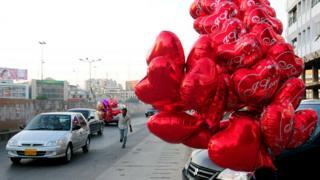 The issue of St Valentine's Day is a polarising one in Pakistan, a country where it has only become widely marked in recent years, writes the BBC World Service's South Asia editor Charles Haviland. In the run-up to this year's festival, one conservative newspaper described it as a "festival of obscenity", asking if Pakistanis would next start celebrating the Hindu Diwali or the Christian Christmas. In past years, conservative social groups, who view the day as a festival of immorality detrimental to traditional marriage, have declared the day to be "shameless". In neighbouring India, Valentine's Day also garners opposition, usually from Hindu conservatives who say it is alien to Indian culture and - as argued by Pakistani Muslims - contrary to traditions such as arranged marriages.